I grew up in an area of the Midwest where “Wild Turkey Wednesday” was a thing...never heard of it? Well, it’s where you drown yourself in shots of Wild Turkey the Wednesday before Thanksgiving as a way to kick off the holiday season. My last Wild Turkey Wednesday in the Midwest…and ever. This was a rough night and one of the worst hangovers I can remember. Now, I never even liked Wild Turkey, yet I participated in this senseless activity because I thought it was fun. What wasn’t so fun was waking up on Thanksgiving day with an incredible hangover hoping to find some greasy food to bring me back to life before it was time to have Thanksgiving dinner. These days, my holidays look a little different. As I approach my second holiday season as a non-drinker, I wanted to share some reflections and observations about how life has changed. With the holiday season approaching in mere days, I know there will be many temptations to imbibe and many stressful opportunities that would have led a previous version of me to conclude that I “deserved” a drink. Here are five reasons I’m thankful to be a non-drinker this holiday season. No hangovers. If it weren’t obvious; I am incredibly thankful to know I won’t be waking up with any hangovers this holiday season. A hangover - no matter how big or small - is enough to deplete anyone of their holiday cheer. The ability to keep my cool. If I’m being honest, the holiday season stresses me out a little. Especially when it comes to family, I feel like there’s a lot of pressure to come together and leave behind the weight of family drama and just be happy and cheery...that is ideal, right? Even though I’m on a spiritual and growth-minded path which has provided me with more patience and willingness to see the good in others and release and forgive situations that have caused me grief….I’m not perfect. And you know what brings out that imperfection and raises my anxiety? Alcohol. Although I haven’t drank in almost two years, I remember the lack of tolerance and filter I had to cope with anxiety-inducing situations when I was operating with a buzz or hangover of any kind. Recognizing the need for and expressing boundaries. Remember that stress-induced anxiety I just mentioned? Turns out, my sober self is also much more aware the need to set boundaries around the holidays (and other times too). Furthermore, my sober self more effectively communicates and enforces those boundaries. Because being alcohol-free has come with a heightened sense of self-awareness, I now more easily recognize the types of situations that are going to be an energetic drain. When I recognize such situation, I can do a couple of things: decide not to go, or set some boundaries around my attendance. This goes for family or social gatherings, but especially events you’re feeling obligated to go to; which tends to happen a lot around the holidays. Your boundaries can be verbally expressed to others (done with care, of course), or internal commitments and promises you make to yourself. I’ve found it’s much easier to recognize the need for, establish and - most importantly - keep boundaries in place now that I’m no longer drinking. Staying present. Many of us use or have used alcohol as a way to inadvertently check out during stressful situations. Whether you love the holidays or find them to be a little on the stressful side, staying present is ultimately the most precious gift you can give yourself and others. The willingness and ability to stay fully in the moment - be that experiencing pure holiday joy, or really processing and working through tough emotions - is a valuable practice. I can promise, you will never regret fully being in the moment and experiencing life for all it has to offer, especially during the holidays. Eating all the food. 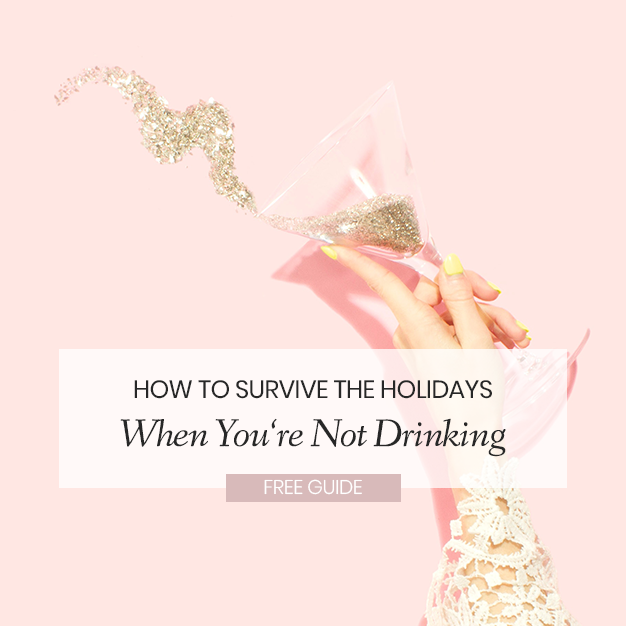 I couldn’t end this post without telling you the one extremely superficial benefit to being a non-drinker during the holidays (aside from the fact that you’ll probably be in much better shape and have great, glowing, skin): the fact that you have extra space (and calories, if you even care; I don’t) to consume whatever you want. Seriously, a big perk of not filling your belly with booze is having more space for all of the other holiday goodies - something I happily take full advantage of. Whether you are a lover of the holidays or someone who gets a bit anxious about all of the hustle and bustle (I’m a little bit of both, personally), there are truly so many benefits to choosing to remain sober during holiday festivities. If you’re feeling the pressure of the holiday season being upon us and want a little extra support staying alcohol-free through it all, download my FREE GUIDE: How to Survive the Holidays When You’re Not Drinking or sign up for a FREE 30-Minute Coaching Session to troubleshoot your biggest concerns about starting or sticking with an alcohol-free lifestyle.